On December 5, Michelle attended the Variety screening of Memoirs of a Geisha at the Arclight Theater in Hollywood and participated the Q&A session. 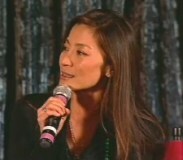 Please welcome Michelle Yeoh! Welcome! Thank you for coming by to our Variety Screening Series. They just saw the movie - I assume you liked it? Yes. Q: So tell me, what attracted you to this particular role? You've done so many films that are so physical and so many action pictures and that sort of thing, and this is a bit of a change of pace. And plus it's a Hollywood movie, for lack of a better word. You know you shot it here (Michelle: That's right) in Southern California. Michelle: Well, I guess you named all the reasons why you should be in the movie. You know, I'm sure when anybody [has] read the book when Arthur Golden came out with it about 8 years ago, any Asian actress or actor wished that this would be made into a film. Because it is a turning point for us, probably a historical moment for us to have an all-Asian cast. Such a magnitude of a film to have an Oscar nominated director, his Oscar nominated and winning team to be so supportive of this. I swear, when I got the phone call to say I was going to meet him, I thought I had won the jackpot, and when he told me I had the role, I fainted - I just passed out. I can't believe it. It was a dream come true. I wanted it so badly. I'm sure all of you who are sitting out there, when you know that there is something you want so bad to do because it would make such a big difference - not just to us as actors but our whole community of filmmakers. This has been a real dream come true. Q: Wow! And the role that you play in this seems to me, deceptively, easier than it is because it looks like the toughest role in the thing. Because you're the mentor, you're the teacher, so you have to be the best (Michelle: Yes). So you had to learn twice as much of how to be a great geisha. Was that a big training process for you? Michelle: It was a very daunting task. I remember a Japanese friend when he said to me, "You know, you're playing Mameha. She is the best geisha. Hatsumomo is the most beautiful geisha, but she is not 'best' in the sense that she does not obey the rules of what it takes to be a geisha. And then Sayuri is an apprentice - she's still learning - but she is a desired geisha. Everyone would look at you, particularly the Japanese culture, would see you and be the most critical of how you played the role." And I was, like, "Thank you very much! I really needed this advice! I'm going to sleep better now!" And then, when I knew I had the role, I first went over to Japan purely as an observer, because I think you learn so much by just looking, listening and watching. The Japanese culture is such a fascinating and very mesmerizing [culture]. They have subtleties that you feel, not just by looking at it but by experiencing, and they show you by the tilt of the head or the little gestures that they do. So I went to Japan, and spent not too long, about a week. I had the privilege of going to a geisha house because fortunately I had friends who had the connections. Because the geisha house is not like a restaurant where you can go and [say] I'd like a table for two. You really need the right connections - and they're really expensive! And I watched these amazing women. And I swear it wasn't just...you'd think that because they are geishas they'd have to be in their early 20s or very young. The best geishas were in their 50s, and when you watch them you understand why, because geishas spend their whole life perfecting their art form, whether it was conversation or whether it was dancing. And the 50 year old dancer was much more eloquent than the 20 year old because her little gestures were just so fluid and you were just...wow! Well, we had 4 weeks to learn that. Aaaaarrrarrrarrr...you begin to know where [we stood], and when we began doing it we have what I affectionately call the 7 Rooms of Torture. Because there was the room where you learned the shamisen. And anyone who has played a string instrument knows that it is torture. It's not torture to yourself but to anyone who is around [you]. And as the mentor to Sayuri, because when she does her debut dance, I play for her in the teahouse. At that point I really wanted to go up to Rob Marshall and say, "Darling, this is a movie, right? I can fake it." [and Marshall says] "uh huh...you can't fake it because a lot of what the geishas do is by experience, by emotions...by really feeling every subtlety that is there." Then there was the room where we learned just to walk in the kimono. The kimono is all the different layers, and seriously, every layer that you put on is the code of what it takes to be a geisha. The two and a half hours, three hours, which is what geishas normally take to get into what they are was what we went through. And we needed that because I felt that every layer that went on was...okay, you do not love. You deny that privilege to yourself. Another layer was you will never marry. Another layer was you will dedicate your life to your music and then to your dance. And every step was a reminder to how you would make this perfect. Q: Wow! And in that one layer that you will never marry, it sounds so...almost like a convent in a weird way. I think American audiences will look at this too, and wonder "is this sexist in any way or..." What's your opinion on that issue? Michelle: You know, you can't judge, this is not black or white. First of all, you know, they are of a different time where we are very fortunate that we don't have to make those kinds of decisions for our daughters or for ourselves. You have to remember, at that time there was such poverty and difficulty in life, they managed to elevate themselves to an art form, and that is something you have to admire. They really spent hours and dedicated their lives to that. We can't say, it is just too easy to dismiss it. I can't find it in myself to, because stepping into this role was a lot of times very difficult, because how do you deny yourself love? For the longest time, I sat with Rob and we'd say okay, and he'd say to me, "You're my Mameha. You have to be the spine of this film because she is the epitomy of what it takes to be a geisha." And I go, "Oh my...[starts to act like she's crying a bit, fakes blowing her nose]...okay...breathe...okay, I will try and do this." And there were many times when, especially in the scene when Sayuri comes and thanks Mameha for selling her mizuage for the highest price, and in her heart she's heartbroken because she doesn't want to face the fact that her heart is broken, her world is crumbling, and yet she has to be so cool and so graceful and remind this young girl, celebrate this moment. Because as actors, we all know the moment comes now, and if you don't enjoy it now, it will pass and who knows if it will come again? So she was a character I couldn't understand sometimes, and I have to say, "Okay, give me 10 minutes, because this is Michelle and I need to go out there and breathe. I'll come back as Mameha later." And you just let it out [she breathes in and is sniffling] "Whoa...! [breathes in again] I can deal with this..." because you've suppressed. When you read the script, you know when Mameha comes - even Hatsumomo is in fear of her. It's like how do you portray a character like that? Well, I had a great team. We have Dion [Beebe]. The shadows that he created because it is a world of mystery, it's a world of allure, it's a world that's forbidden in many ways. Then Colleen Atwood, who gave these amazing costumes, these kimono, that every layer that she put on us reminded us of who we were as geishas. Q: You mentioned Rob Marshall, and it seems like...he had done Chicago and he did Annie on television and a lot of Broadway shows. But when he was chosen to do this, people were a little bit surprised. They said "Wow!" And he seems to be the perfect director for this. Especially with his background as a choreographer because there is a lot of dancing in this in it's own way too. What was it like to actually work with Rob? What did he bring to your performance? Michelle: We say he's like silk and steel. He was very clear in his vision. Just imagine, he had to hold the hands of 8 actresses! Not easy, right? Okay, two of them were little girls, that was easy. There were 6 of us. And not for a moment did he ever let any of our hands go. Each character had their moment, each character had their own story to tell, and each character will bring you into the world of pain, of love, of why they are the way they are. And it takes a director who is very brave and who stands very firm. Because as actors, you get lost in your own world, and you start creating this fantasy. You know, like the whole movie is just about you. [laughter; Q: But isn't it!?] Of course it is! That's where he's brilliant. Because it is about each of us and how we all get together as one. I mean, he's brought you in. He dances with you. He wraps you around with his silk and he takes you. He has rhythm that's fluid. And then there's all these amazing landscapes, just like you've stepped onto this boat ride in a river, and it's meandering along in this breathtaking landscape and you need all these characters that have such emotion, such depth, and so different. To talk to, to caress you maybe, and then they walk, they disappear, and they come back. And you're just mesmerized. He literally has created this magical world for you. What more can you ask of a director? Q: I know. And you got to work with Ziyi again, your Crouching Tiger Hidden Dragon costar. Did that cause a lot of shorthand between you as actresses, that you almost had a sort of relationship in a way going into this project? Michelle: I think that was the advantage we had. I think when Rob saw Ziyi and then saw me, he saw that bond, that chemistry, between us. But I must say, when we were doing Crouching Tiger, Hidden Dragon, it was much more difficult because Ziyi spent half the time dangling on wires. So it was "Hi! Nice to see you! Good girl! Keep it up!" And then, after two weeks of filming, I had an accident while we finished a fight sequence, and I had an ACL reconstruction done here in America at John Hopkins. So while while she was up there, I was on the earth trying to learn how to walk again so we could fight again in the last sequence. But in this film, we had an opportunity to really do the girl thing. You know, I've always been the big sister, and today it is so wonderful to see the little sister blossoming into such a beauty and so talented. So when we were on the set, we were laughing, playing, falling over. She has to walk in these shoes that are really high, and we all do it. And the set is so amazing, it's cobblestones along the way, and I remember one day we were holding each other up. We're going, "We're going to fall and break our ankles!" Through that scene, I would fall over, then we would walk and then Ziyi would fall over, and we would walk and then Rob Marshall would come over and say "Okay, girls - I thought you were such amazing martial artists, dancers. Can't you even walk!?" My god, we should give him those shoes! Q: You know, there has been a little bit of controversy about the casting process and about Chinese actresses [being] cast, and people said, "Why not Japanese?" Rob Marshall said that he cast the best actor for the role. It doesn't matter to him what nationality or anything. Is that true? I mean, you're an actor and you play different roles anyway. That seems to be the fair way for it to go. Michelle: I think it is very very important that your director believes in the actors that he has chosen because at the end of the day it is really, truly his vision of a film. In Asia, we play Japanese, Koreans, Chinese, Malaysians, Indonesians because we are of the same color, we look alike (note: I agree, this doesn't sound right). It's very similar to out here where the Americans will play the German or French or Italian and vice versa. We have never ever questioned that, and so we never questioned this. For us, it's the character that we are given to play, and as actors I think what you do is you pay the ultimate respect to the role that you have the privilege to play and make sure you do all the right things for it. Q: I have to say, what a cast across the board in this movie. Just everybody. [clapping] What were some of the most surprising things you discovered when you started playing this character? Michelle: The culture of the geisha was completely new to us. I can't say I knew anything about it except the fact that as a child, I grew up with ballet, with dance. So I watched these amazing dolls come to life, and they just moved across the stage and danced for you. After that was when you have the opportunity - even Ken, or Kaori, or Koji would turn around and say to you they don't know very much about the geisha world because it is very mysterious and very private. It is very well protected. And it is very much like the Asian culture. Something as simple as the martial arts. You don't really know what is behind it. You might learn the very superficial things about it. So for us every day was a learning experience. Every day was a new challenge, every day was like "Oh my God, there's something more!? I haven't even learned this and there are 20 more things to learn! [Q: Pouring sake] Everything was a ritual, and that is what the Japanese culture was about. Q: You obviously visited a geisha house. It is a different form of geisha, isn't it? Michelle: It's very very different, purely because the Japanese culture has evolved and developed since then. Because this movie was set in the 20s and the 30s prewar and also in times very different from what it is today. Today, young girls choose to be a geisha. In the past it was not like that. It was a very beautiful, artistic celebration of music, dance, calligraphy. Everything was so ritualistic, but you have to spend your entire life, dedicate many hours of your life. It is literally like a prima ballerina from New York or London Academy of Dance. But today, the young girls can say, "Okay, I would like to train as a geisha, but then after I've done five years I'm going to marry my boyfriend." It's different. Time has changed. But I think the most important thing is the preservation of the essence of this, because there is so much - the beauty, the essence - that needs to continue for the years to come. Q: How do I get me one of these geishas? Michelle: How do you what? Q: I'm sure some guys out here are thinking that question. Are there geishas that aren't Asian? Michelle: [It's] good you asked that question, because our consultant while we were in training was Liza Dalby. She is an American, and she went to Japan and she entered the world of the geishas. She was accepted into it, and actually one of the reasons, she told us why, was because she was fluent in the shamisen. She played this horrible instrument. I mean this - I didn't say that [laughs], no I didn't say that. This amazing instrument. She was our lifeline because she was there with us. She managed to express to us and tell us how and what it felt like to be a geisha. I'm sure if any of you know our Japanese friends, they're very very conservative, and it is very difficult for them to express the inner emotions, what it feels and what it means to be Japanese. And fortunately we had Liza Dalby. Q: You mentioned 2 Rooms of Torture. What were the other Rooms of Torture? Michelle: The first one I mentioned was the shamisen, right? And then there was...just learning how to walk in the kimono. Once you have the kimono on, your whole posture changes. And also the kimono has the train, as you have watched in the film. The geishas are moving pieces of art not just from the front but from the back as well, and in our culture it is very rude to turn your back on someone. But the back of the geisha of the Japanese culture, the obi - you know, the intricate embroidery and then the train. But you have to make the train flutter, and you cannot do it by modern day walking. Contemporary walking does not complement the kimono. And when we trained to do that, first of all it was wearing only one layer of the kimono to get into the hang of things. To start off with, we tied our knees together and then after that, so we would have more rhythm, there would be a piece of paper, a thin sheet of paper, between our knees. And when you graduate, you have a bottle of sake - before drinking it - on top of your head. We have to glide across the room. So that was the second room. The third room - I really enjoyed that room - was the dancing. That's where we did all the fan dance. And the Japanese dancing is all about the subtleties of just the way the head is placed, the hands. It was that that gave you the feeling of what it was like. Then there was the room of the dialect, the dialog coaching, because [for] some of my fellow actors in the movie, this is the first time that they are doing a film in English. Like Kaori Momoi. Like Koji Yakusho - I'm sure you've all seen him in Tampopo, or Shall We Dance. He's one of the most brilliant, brilliant actors. I remember meeting him when we come in for rehearsals. I'd say "Good morning Koji" and he'd go "Mmmm" (low growl). Okay? Nice! We're like, "Come on, Koji!" and he's like "mmm mmm". Even today, he will be like "mmmm nice, mmmm good!" But when he came out with his dialog, it was just flawless! You wouldn't believe he didn't speak the language. And the same [goes] for Suzuka, the young Chiyo. She didn't even know how to read the alphabet. [Q: My gosh] Every one of them! 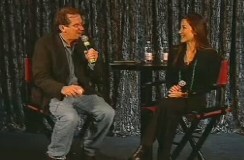 And Gong Li - you know how much effort they put into this because they so believed in this project. You know, language is one of the tools that we communicate with the audiences. Then there was the room where I think we treasured the most, which was the room with Rob, where we learned about our characters and understood his vision of his film. What he wanted from us and what we needed to give him. Then, of course, there was the room where we had our readings. We worked together as a team. I guess that would be the funniest room because we had sometimes more interpreters than actors. It was like "Oh, you're not the actor? Oh, that's the actor!" It was amazing - you're a little shy at first, and some of them didn't speak the language. I was fortunate because I speak English. I speak some Mandarin since Crouching Tiger, Hidden Dragon, and I understand a little bit of Japanese because I have always been so fascinated by the culture. But what was amazing was we would be talking at full speed - there would be Gong Li, Ziyi and myself going on in Mandarin and the Chairman, Koji, Kaori and Yuki going full speed in Japanese and Rob Marshall, the ever graceful Rob Marshall, standing there going [she makes a patient face] and goes "I don't think so!" and we're like "What do you mean you don't think so!? You don't even know what we were talking about!" But by then, everybody seemed to have that understanding, that bond. Maybe it was the body language, I don't know what it was, but we understood what the other one was trying to say and we could communicate without the interpreters.